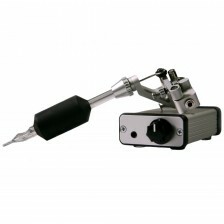 LACEnano is a revolutionary ultra-light rotary machine, which weighs only 45 grams and therefore is the lightest professional tattoo machine worldwide. It works on the principle of alternating magnetic motor that is ideal feature for every tattoo kind or style. Hence it is perfect for lining, shading and coloring. Made is from high quality aircraft aluminum, alternating 40W brushless motor and miniature bearings, which are delivered to dental devices. Thanks to those components, this entire machine can be sterilized in autoclave.